Too Precious! Corner-to-Corner Baby Blanket	5 Dishcloth Patterns—Perfect for Beginners! Bohemian style is all the rage! Just look in any catalog, on Pinterest, or home-décor website and you’ll see this trend everywhere. Characterized by jewel tones, batik prints, and crochet and macramé accessories, “Boho chic” has a distinctly artistic flair. 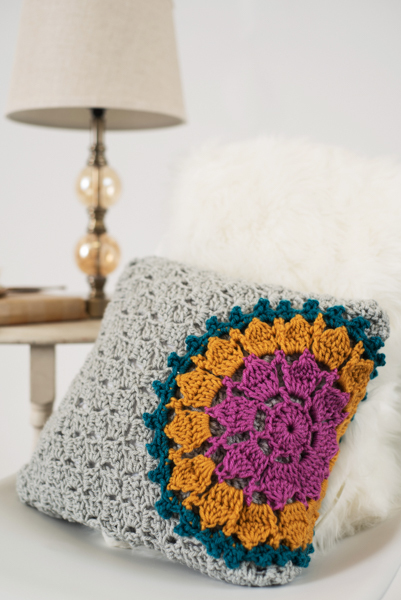 The Mandala Burst Pillow crochet pattern brings Boho chic elements together to brighten your décor and give it an instant update. 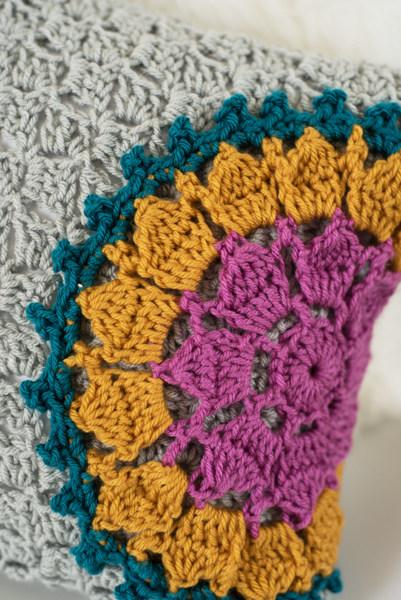 The mandala motif’s rich color scheme stands out against the soft gray background, highlighting the crochet texture. Of course, you can always change the yarn colors to match your home decor. A crocheter with intermediate skills can easily make this pillow. You work the front and back panels separately, corner to corner, and join them together with a border on one side. The mandala is worked separately, then laid over the seam, stitched around the outside edge, and stitched in place with three-quarters on the front and the rest toward the pillow back. Then, insert the pillow form and stitch the panels the rest of the way to finish. Just find the perfect place to show off your stunning pillow! Kristi Simpson, known for her fresh and modern patterns for crochet accessories, designed the Mandala Burst Pillow for I Like Crochet. Kristi’s patterns are fun to make and perfect for gift giving.